Walnuts, Parmesan and tarragon combine to make a great alternative to traditional basil pesto, especially when served with sweet potatoes and juicy fillet steak. Peel the sweet potatoes, cut them into chunks and cover with water in a saucepan. Boil for 15–20 minutes, until soft. Drain and mash. Season, stir in the olive oil and keep warm. Meanwhile, place the walnuts, Parmesan and garlic in a food processor and whiz. Add the oil and tarragon and whiz again, until the mixture forms a coarse paste. Season and set aside. Heat a ridged pan or grill until very hot. Season the steaks and, depending on how thick they are, cook for about 2–3 minutes on each side for rare, 4 minutes for medium or 5 minutes for well done. Serve with the sweet potato mash and a good dollop of walnut pesto. 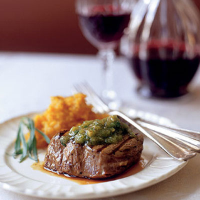 With the pesto flavours and the sweet mash, this piece of beef needs a warm, savoury Sangiovese from Tuscany, with just enough sour cherry fruit to balance its creamy Mediterranean richness.